A Cardiff couple infected with HIV via contaminated blood products are taking their fight to the British courts. 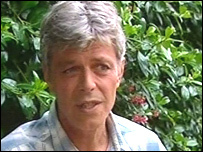 Haydn Lewis, 50, a haemophiliac, was diagnosed with HIV in 1985 after being given contaminated blood. His wife, Gaynor, was unwittingly infected. A US judge has ruled that their case against US pharmaceutical companies should be heard in Britain. More than 1,700 patients given the contaminated blood more than 20 years ago have died. Many more are terminally ill.
During the 1970s and early 1980s, nearly 5,000 people were exposed to hepatitis C and of these more than 1,200 were also infected with HIV. A compensation agreement with the UK government was reached for all haemophiliacs affected in 1991 but lawyers for the couple have said the claim was "under-unsettled". The couple are part of a litigation claim, involving six other claimants, running in US courts. They are against a number of large US pharmaceutical companies which supplied the NHS with blood products in the 1970s and 80s. The drugs companies successfully argued that it would be more appropriate and convenient for the cases to be heard in the UK. A claim form on behalf of the couple was issued on 23 August in the High Court against a number of American suppliers. Mr Lewis told BBC Wales that one advantage of the case running in British courts is that the Department of Health might become involved as a co-defendant in work to match the infected blood products with patients. He said: "It's down to the pharmaceutical companies to call them to be co-defendants. It's not for us to ask for them to be co-defendants. "I would hope they would do the decent thing anyway. "They've been [saying] that they were sympathetic and open and transparent, so if they've got nothing to hide, maybe they should just provide the information to the legal process and speed the whole process up, hopefully. "The batches were sent to Britain but then they get disseminated through the UK, but which patient received that batch, is still undecided. "Now, patient records are not as complete as one would wish so we've still got this anomaly [of] which batch infected which recipient." In June, Mr Lewis gave evidence at the independent review, headed by Labour peer Lord Archer of Sandwell, a former solicitor general, into the circumstances surrounding the supply of contaminated NHS blood and blood products. The Department of Health said it had "great sympathy" for those infected and wanting to know what happened. "However, the government of the day acted in good faith, relying on the information available at the time. "We have been open and transparent on this issue, ensuring that as much relevant information is in the public domain as possible, with numerous documents having been released under the Freedom of Information Act." It said a review of papers on contaminated blood products, including those returned to the department from a firm of private solicitors, have been made available to Lord Archer's inquiry and other interested parties.